Shopify has passed the $1 billion USD annual revenue mark, as announced in its fourth quarter and 2018 year-end financial report released Tuesday. Shopify’s full revenue growth for 2018 reached more than $1 billion, a 59 percent increase from the same time last year when the Ottawa-based company pulled in $673,304 (all numbers USD). The Ottawa-based company’s revenue was bolstered by its merchant solutions such as its POS card reader, launched in 2017 and its Tap & Chip Reader announced early 2018. These, combined with its other existing merchant solutions, grew 67 percent year over year to more than $608 million in revenue. Shopify’s subscription solutions, which include licensing its platform to allow retailers to create online stores, also saw significant growth over the past year, growing 50 percent to $465 million. Shopify also announced revenues for its Q4 ending December 31, listing total revenue for the quarter as more than $343 million, another increase of more than 50 percent in year-over-year growth. It attributed much this success to sales on its platform throughout the Black Friday, Cyber Monday period with racked in $1.5 billion in gross merchandise volume (GMV) in four days. The company also noted that the majority of those sales came from mobile devices. It also noted the launch of Shopify Payments in Spain, announced in October, as another area of growth for Q4 2018. With its move into Spain, Shopify’s platform became available in 11 countries and it stated that it reached a record percentage (24 percent) of new merchants using its platform, that are outside its core geographies of North America, UK, and Australia. 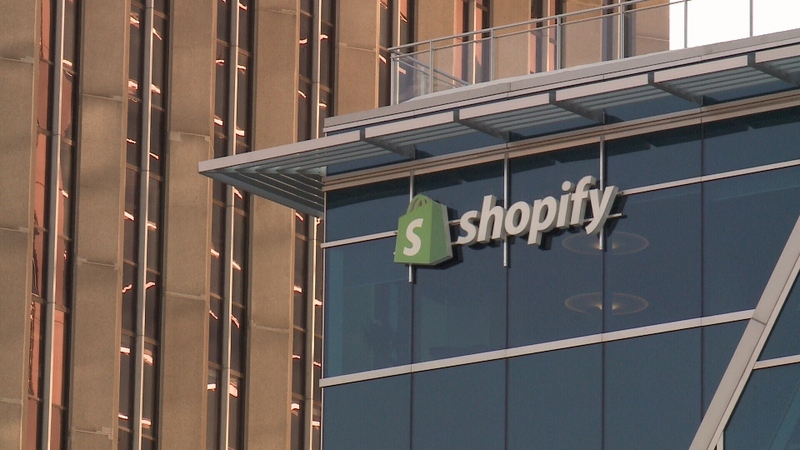 Along with its significant growth, Shopify also listed fourth-quarter operating losses of $9.5 million in 2018, up from $6.1 million. Though it should be noted, that this is a consistent operating loss of 3 percent of the companies revenue from 2017 to 2018, respectively. According to the Ottawa Citizen, this fourth quarter marked the 14th consecutive time that Shopify has exceeded analyst expectations for its revenue. Surpassing both expectations and the $1 billion revenue mark makes Shopify one of few Ottawa-born or based tech companies to do so, and one of the quickest to hit the milestone. The only other tech company to come close, according to the Citizen, was Newbridge Networks, which, founded in 1986, passed $1 billion in sales just 10 years later, and $1 billion in revenue 13 years after its inception. Shopify is predicting its revenue for the 2019 fiscal year to hit somewhere between $1.46 billion to $1.48 billion and operating losses to range from $140 million to $150 million. “Shopify continues to deliver impressive results, while at the same time facing growing pressure to deliver from the stock market,” Mark MacLeod, founder of SurePath Capital Partners and former CFO for Freshbooks told BetaKit. He also noted, however, that this growth is likely to slow down based on the company’s forecasting.